If you are currently searching for a device with better performance and longer lasting battery, you might need to consider the Surface Pro 4. That is now the case after Microsoft updated their CPU. Even more, the device is more flexible and without a fan. The Microsoft Pro 4 is among the stylish, premium and slim tablets in the market running Windows 10 OS. You can convert it into a laptop by simply attaching the type cover keyboard – sold separately. It showcases a 12.3-inch PixelTouch display along with 3:2 aspect ratio. The other features to expect include 2736×1824 pixel screen resolutions, Corning Gorilla Glass 4 for maximum protection and 267ppi pixel density. The device’s display features assure crisp and clearer picture quality. The manufacturer has included the 6th generation Intel Core i5 processor, 4 GB of RAM and Intel HD Graphics 520 for powering purposes. In addition to the 128 GB SSD, the device supports expandable memory through MicroSD card reader. The battery will last for 9 hours on regular usage and supports both Bluetooth and Wi-Fi connectivity. 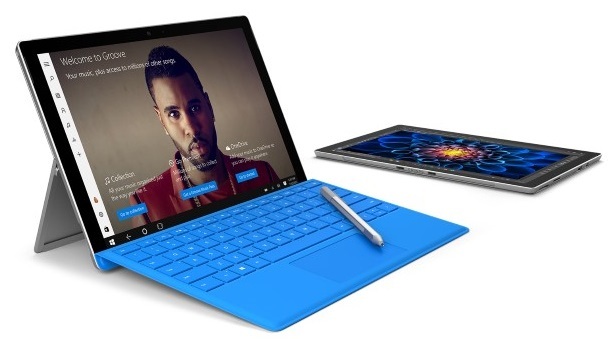 Microsoft has offered the Surface Pro 4 in sixth generation Intel Core M, Core i7 and Core i5 options. The Core i5 is available with the slightly powerful Intel HD graphics 520, while the M version is available with the HD Intel graphics 515. Microsoft supplies the top i7 variant with the Intel HD graphics 540. If you need a more complicated device, you can choose to load it with 4GB, 16GB or 8GB of RAM. The product has great performance compared with others of similar class. You can therefore use it as your primary laptop and tablet. The product will load any web page instantly, ran all applications smoothly and play Steam games. Whether you are a fan of capturing photos or not, you will definitely like the tablet. Its plus size dimensions make it a better device for capturing images. Unlike the many tablets in the market, which feature poor sensors that can only capture poor but useful photos, this one will capture higher quality images. The product proves accurate with the real-world use due to its solidly impressive performance. Its 8-megapixel rear camera produces images that you can share on your social media networks, including in the regular light. However, you should not expect rich or vibrant colours. The product’s 5-megapixel front camera is also interesting. The device boasts the Microsoft Windows Hello feature that pairs the primary camera with a freestanding sensor that reads partial information. With the tech, the Pro 4 scans and records registered users’ faces. After scanning, the device will automatically unlock – only if you are the registered user. Even though you can use the front 5-megapixel front camera to take selfies, the photo quality will be much lower than that of most smartphones. However, it will work perfectly when video calling on Google Hangouts or Skype. Battery life will always be among the top considerations when buying a mobile device, particularly if you travel a lot. 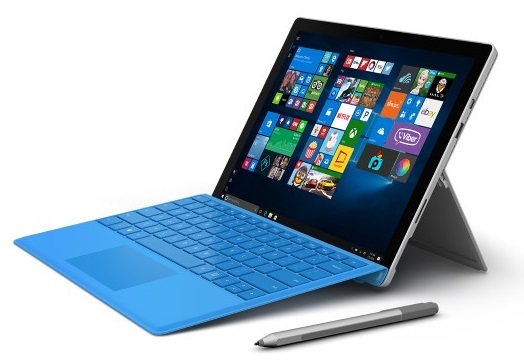 The Surface Pro 4 has the same nine-hour mixed use battery life as Surface Pro 3. With the screen brightness in the manufacturer’s recommended setting and with average use, you can use the device for nine hours before recharging. Regular use involves using the device as your primary work or home machine, checking social media and email feeds throughout the day, periodically browsing the web, 30 minutes of casual gaming, and watching few movies. With demanding tasks, expect the battery to last for a few hours. When streaming videos, the device will discharge at least 17% per hour. Considering Android and iPad tablets standard that is not good. However, it is pretty impressive when it comes to devices from Windows. Other devices from Windows will generally discharge 15% to 25% per every hour when streaming videos. Gaming will also drain the battery faster. When playing moderately, the device will discharge between 18% and 25% of battery. That is the standard for laptops but below the standard for tablets. The Microsoft Surface Pro 6 features stereo speakers with Dolby Audio. During your purchase, you should remember that the speakers are not powerful enough to compete with Bluetooth speakers or dedicated sound systems. However, the speakers are above average when it comes to laptop or tablet devices. The speakers are loud enough and you will therefore enjoy your movies or music. The sound quality is also impressive and the speakers rarely push the higher end. The bass levels will provide you with fittingly immersive sound feel especially when watching TV shows or movies in a closer proximity to the device. However, you might need external speakers if you are a serious music enthusiast. The device’s sound quality fades immediately you start moving from the tablet. The product comes with a 3.5-mm headset jack, a full-size USB 3.0 port, Surface Connect port, a Type Cover Port, stereo speakers with Dolby Audio and stereo microphones. On its front, the device sports 8.0MP rear-facing camera that can record 1080p HD videos. On its front side, the device features a 5.0MP HD capable camera that you can use for video calling. The Windows Hello with biometric sign will help you access the device easily. It will scan your iris, face or fingerprints to verify your identity and provide access to your personal computers, laptops and Windows phones. The sensors feature Gyroscope, Accelerometer and Ambient Light Sensor. The Surface Pro 4 is currently the best Windows 10 tablet you will get in the market. With the product, Microsoft offers a brighter, crisp display, solid built quality and greater performance. 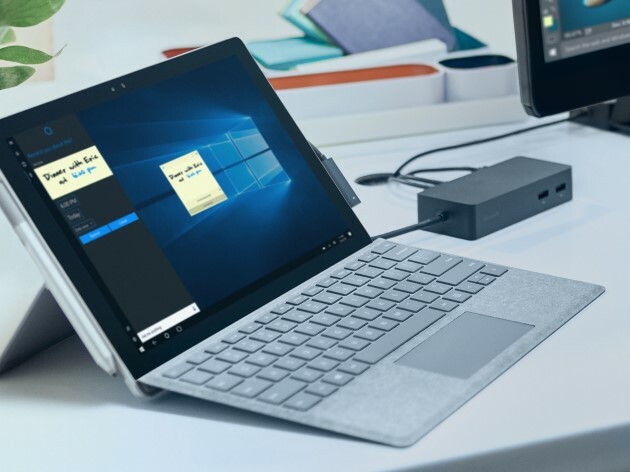 With its Surface Pen and the option Type Cover, you can change the device into a full laptop that will meet your work and personal needs. The manufacturer charges $110 for the Type Cover. Remember that most tablet manufacturers offer free keyboards. If you are a buyer on a tight budget, you can consider the other available devices. The Surface Pro 4 is suitable for people in need of top-end performance.